Teaching their children about the danger of guns, toy guns, or anything resembling a gun. 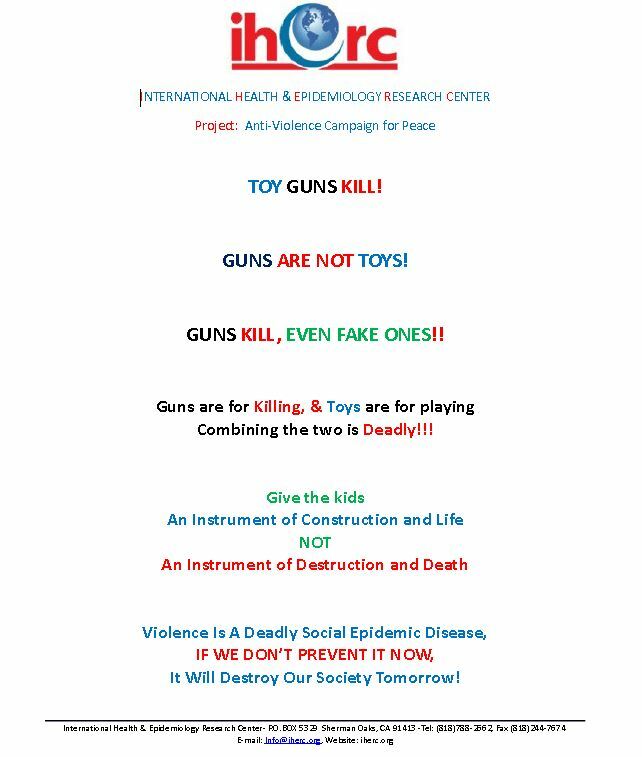 (See the Fact Sheet About Toy Guns). Telling store managers and owners that you are not going to buy from them if they do not comply with your legitimate request. This is a very powerful and effective method since they do not want to lose customers or money. If you want their attention, you must affect their pockets. Not buying any toy guns, toy weapons, anything symbolizing violence, or any toys that can send violent messages to children. Supervising their children in what they watch on TV, in the music they listen to, in the video games they play, and in their activities on the computer. Not buying or renting violent video games or movies. Remember, children are in their learning stages. They mimic the actions they see; their behaviors are more easily influenced than adults. Ask other parents if they have guns in their home before allowing kids to play in their home. Talking to the managers or owners of any store that sells toy guns, toy weapons, dangerous toys, violent games, and movies and convincing them to remove these products from their store. Giving your children love, responsibility, self-esteem, and self-respect. Teaching children morals and embracing all the differences, not only tolerating diversities ; including respect for other religions, cultures, and sexes. This is most important! Click below and download our brochure for more information.